GGI2019 returns to Belfast (Feb 15-16) and for anyone going, we have organised a series of social events where speakers, volunteers and friends can get together and let their hair down! Below are the arrangements for dinner over the course of the 4 days in Belfast and the ISOGG Day Out on Sunday 17th Feb. Clicking the links will give you the directions to each venue. If you are interested in attending any of the events, please email me (mauricegleeson AT doctors.org.uk). Places will be offered on a first come first serve basis. 16.30 … ISOGG Discussion - how did it go? whither next? what would you like to see at the next GGI? This award winning tour takes us through the history of the conflict in Northern Ireland, known colloquially in Ireland as “The Troubles”. This tour is recognised not only as the No.1 walking tour in the city, but also as one of the most unbiased, engaging and accessible insights into the conflict for visitors of nearly all ages. The tour explains how the Troubles began, tells the stories of the people involved, their place in the conflict and the effect these attacks and incidents had on the city and its people. It also shows how far the city has come since the ceasefires and Peace Process. Between 1971 and 1998 Belfast City Centre was the setting for many tragic incidents of ‘the Troubles’. Our unique walking tour of the City Centre visits the actual sites of some of the most significant events. This is not a sightseeing tour in the strictest sense, (although you will discover art, architecture, bars and museums in parts of the city you may not otherwise have found). There is no physical reminder or legacy of the incidents involved. Belfast City Centre is now an active, vibrant place, far removed from the time when it was secured with a ring of steel and security checkpoints at every entry point. The tour examines the troubled past of our city through historical accounts and the stories of those involved. Our walking tour allows you to get a real feel for the history of the city, – many of our guests say they have felt transported back in time through the rich and detailed story-telling. 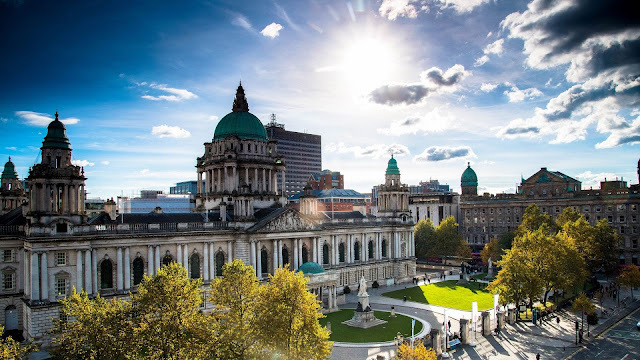 It offers total locational authenticity; we will bring you to the sites of many of the most significant incidents in the history of the Troubles, such as Bloody Friday, when 23 car bombs were driven into the city, resulting in a tragic loss of life. It is then for you to decide whether these incidents have left an invisible but indelible mark on our city. The tour will allow you to better understand Belfast’s recent past and also appreciate the reconciliation and regeneration which has taken place. It is honest, accurate, objective and enthralling. We understand this period of our history can appear hugely confusing to visitors to our city, and you may have many questions, – we guarantee our guides are capable of answering each and every one! Book your own ticket online here … https://crumlingaol.admit-one.eu/?s=CRUMGAOL&p=calendar&_evt=GTOFF&mn=201902 … Make sure you select the 2.30pm tour on Sunday Feb 17. The tour may be sold out on the day so please buy your tickets in advance! Looking forward to another fabulous few days in Belfast !